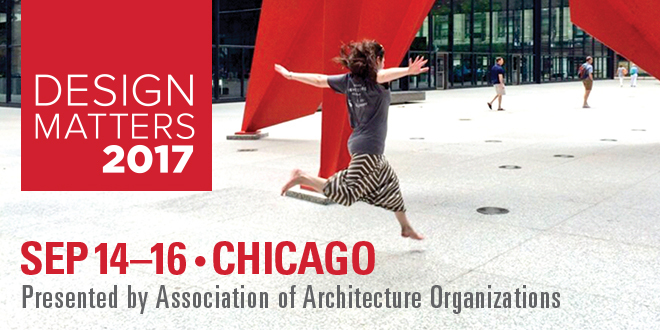 Who Attended the 2017 Design Matters Conference? Abstract: At the Design Matters Conference in Chicago, we take a closer look at the many inspired ideas and methodologies design organizations employ to catalyze civic participation. Three specific venues are discussed: (1) the state of the community meeting; (2) opportunities for uniting a critical mass of professional designers to achieve a common purpose or voice; and (3) strategies for involving youth in urban planning initiatives. Just as we look at the best of our current thinking, we also set aside time to consider future goals and necessary next steps, such as improving diversity within the leadership ranks of our field. Again, we ask: how can design organizations make a significant impact? Thank you to all who attended the 2017 DESIGN MATTERS CONFERENCE, and to our family of sponsors and local host organizations who made the event a reality. This year’s meeting attracted 138 attendees, hailing from 33 U.S. cities and 9 countries. Our keynote lecture, held in partnership with the Chicago Council on Global Affairs, allowed us the chance to invite dozens more local students and public attendees. In a return to form from earlier AAO meetings, we packed the first day of the Conference with several toolkit sessions addressing daily management challenges. Cassandra Di Prizio (of the nationwide consultancy The Alford Group) delivered a memorable presentation on fundraising strategies for smaller organizations. The positive audience response has us already looking at the development of a longer training session with Cassandra, so we can take up more involved issues of donor cultivation and sponsorship negotiation. Amy Liu, Director of the Brookings Institution’s Metropolitan Policy Program, kicked off the second day with an incisive look at the changing landscape of economic development and city building. Her run down of the current Amazon H2Q sweepstakes was a perfect case study for 2017, animating not just her prodigious statistical research but providing us a common stage for analyzing the combined actions and motivations of our elected officials, business leaders, designers and news media. But if Amy took the morning, Dr. Sharon Sutton lorded over the afternoon, bringing great commentary to our closing panel on Inclusion in Architecture, drawing on her experiences as a black woman student, practitioner, and academician, breaking barriers at every stage in her career. Above all, I’d offer you this parting shot about the 2017 meeting: AAO is growing up. From the presence of ArchDaily and Metropolis to the American Planning Association and the Association of Collegiate Schools of Architecture, our annual meeting is beginning to attract leaders from partner organizations who bring new perspectives and new reach to our dialogue. The conditions are ripe for public engagement design organizations to take another few leaps forward. Whether the topic be the expansion of K-12 design education or the art of community convening, these strategic partners are coming to the Design Matters Conference to engage your organizations. To that end, I very much look forward to seeing what new goals we can attain together. Speaking of gatherings, I’m pleased to announce that next year’s meeting will emerge for the very first time on the West Coast. Mark your calendars for Seattle, November 15-18, 2018, and the chance to be with all your peers at Seattle’s newly christened Center for Architecture & Design—home to AIA Washington Council, AIA Seattle, Design in Public, and the Seattle Architecture Foundation. Much more on that meeting in the weeks to come!